Arunny is outgoing and energetic. She’s at ease answering questions about her life, and she smiles a lot. Arunny starts work at around 7:30am each morning. She’s training to be a chef at the Cambodiana Hotel. She describes herself as being a fast learner, and says that she has learnt a lot in her short time training. Arunny loves being a chef, and has always dreamed about becoming one, but until three months ago, she never thought she could achieve it. When Hagar’s partner found Arunny, she was working in a karaoke bar, in poor conditions and with minimal pay. Arunny was very unhappy, she had wound up working there after a great deal of sadness in her family. Her mother had died, and her father did not want to care for her. He shortly remarried and moved away, leaving Arunny with no choice but to seek work. A friend was working in a karaoke bar, and Arunny saw a way out. She was devastated by the loss of her mother and the abandonment by her father, and she didn’t feel as if she had been left with any choice in what she could do next. Arunny describes herself before coming to Hagar as shy, silent, and easily afraid. Someone would speak to her in a loud voice, and she would cry. Now, she says she is more confident and can stand up for herself. Hagar’s Economic Empowerment (EE) team has been working with Arunny for four months. They gave her work readiness training, ensuring that she was ready for the workforce and knew common work place etiquette. Her EE officer helped her to find opportunities for training through Hagar Catering, and Arunny started off her six weekly training rotation in the widely renowned Intercontinental Hotel. Not only is Arunny developing basic skills, but she is being trained by some of the best in the business. As a person, Arunny feels she has grown since she started work, “I feel that before I was a bit shy, but now I am open to talking about my problems with staff. I am open to getting advice from the trainer or the staff there. I’m braver. I am more open minded when I get advice.” As far as her skills go, Arunny has learnt so much. She shares that she feels confident with her skills. She’s good at chopping vegetables and preparing meals. Arunny hopes to learn to make sour soup, which is her favorite thing to eat. Beyond hoping for a good sour soup recipe, Arunny dreams of owning her own cooking stall. Now, Arunny says that she is strong and empowered, but that she knows she has some growing to do. She wants to be like her boss as she continues to grow, because she cares about her employees. Arunny says she often checks in with them to see how they are feeling. She says that she loves the work environment. Not only is she happy to develop her skills and work in the area that she loves, but she’s also grateful for the staff, and the way that they encourage and support her. 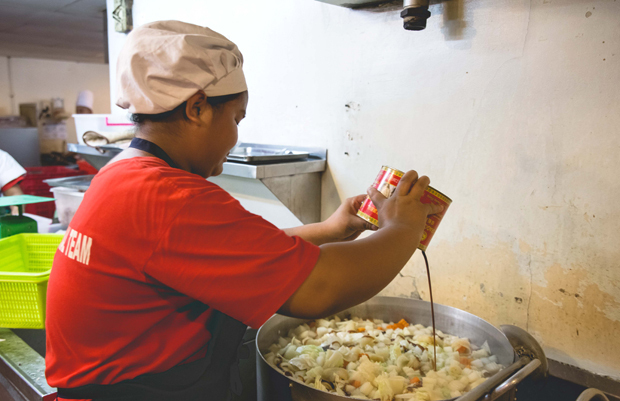 Arunny will continue to be supported by Hagar as she journeys toward becoming a fully qualified chef, with staff members walking each step of the journey with her.